Staying in tonight to watch Polling Night of my country, keep refreshing Ubah and facebook website to check the latest score. Gan jeong-ness!!! One thing that bothers me is that why the scores from TV and Ubah unofficial website (Ubah) is inconsistent >, <''' Well, I know media might have some interest conflicts to announce or publish the opposition party's scores. But what's the difference?!!! At the end of the day, you gotta let us know the true numbers! Let's pray hard we will win this battle because our country need a change *finger crossed*. While keeping track with the numbers, my new outfit post is up just in case you guys misunderstood i'm blogging about my views on current election issue :P Hopefully you guys can read until the end, thank you very much *blow kiss*. Casual chic style is always my favourite all-day-long outfit. Despite of staying stylish, i love to keep things simple and make sure the outfit is comfortable for me to move around when I'm hanging out with my friends outside. I wore an oversized jersey top with black jeggings doing shopping spree with my friends last Saturday. Oversized top is a good choice when comes to shopping because its loose collar design allows me to easily change without ruin my makeup (especially my red lips colour) while trying the clothes. 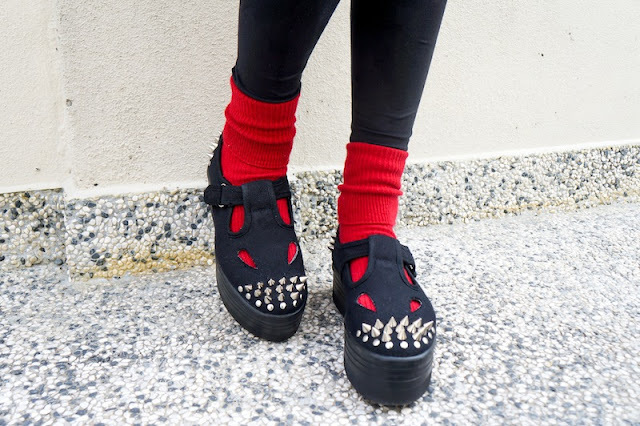 For a fashionable finish, I styled this black coordinate with a highlight of red colour - socks and a sling bag. Red colour is sharp, striking and exciting. Its combination with black creates a bright energy and passion for the look.